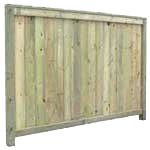 Natural, Beautiful, Stainable high quality fencing. Basic, simple to build design using top quality lumber. 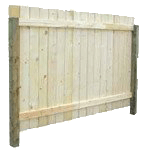 Your choice of 1′ x 6′ fence boards in spruce, cedar, or pressure treated. 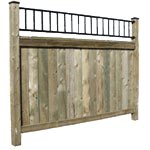 A dual function “good neighbor” and privacy fence all in one. No-sag design ensures long-lasting great looks. 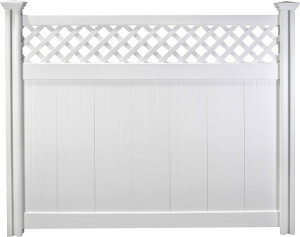 A deluxe “good neighbor” fence with a unique lattice accent for that distinctive look. Strong, no-sag design will look great and last for years to come. Powder coated galvanized steel lattice top (diamond or garnet styles available). 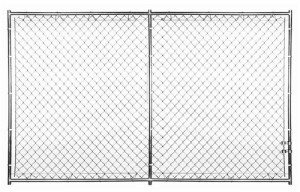 A deluxe “good neighbor” fence with an “iron” feature and our strong, no-sag design. A great choice if privacy is not a concern. 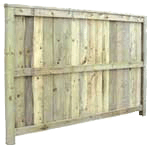 Perfect for open view back yards, dog runs and commercial fencing. Your choice of galvanized or coated link, privacy slats available. 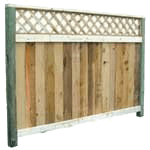 Long lasting vinyl fencing. great for use in condos and commercial applications.